Although that close up render does make me wonder about the dual molding of that pair of legs. It appears the right leg is green on the upper section, as you can see the sharp edge of the green underneath the printing, and on the inside of the leg. Whereas the left leg appears to be dark orange or similar on the upper section, as you can see this at the edges of the print, especially on the corner where the prints do not line up, and at the edge of that pink patch. I think you might have it sort of twisted—Mickey and Minnie are most likely in this one BECAUSE of the Ideas set. 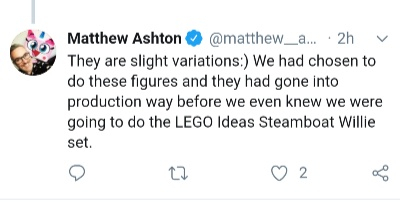 Creating the new molds for the minifigures series was likely the only way they managed to justify producing them, considering minifigures series tend to be produced in great enough quantities to justify the budget for new molds whereas Ideas sets do not. They managed something similar with Doctor Who's sonic screwdriver debuting in Dimensions. I'm not really a Disney collector so most of the series doesn't hold much appeal to me, but most of the figs do look great. Whatever the reason for including, given the ridiculous price of the Ideas set some may be tempted to just pick up the CMF versions instead. Not complaining, just doesn't fit with the usual LEGO way of putting the most desirable figs in an expensive set. 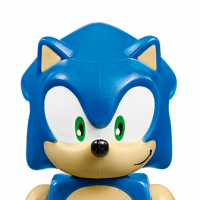 They might even be chase figs as the box distribution isn't known yet as far as I'm aware. It would've actually made more sense to make a set of 20 then just have 3 full sets like TLM2 CMFs; it's not as if there are any obvious army builders in there apart from maybe Hercules that people might want multiples of. Goofy and Pluto would make 20 total. They could use Scooby-doo's body, then a new sculpt for Pluto's head. I always look towards upcoming DVD and movie releases as marketin... er... inspiration for the figure choices in these series. The addition of Jasmine and Jafar could be explained by the live-action film coming out soon. Not that I think they needed an extra reason to add them to this series, but it would make sense to me as to one reason they're there. I thought more about the series last night and looked closer at the pictures and decided even more that I'm thrilled with all of them. Despite not being a huge Hercules fan, I think the two characters are still well done. Would I have selected others to be in the series before a handful of these? Would it have been nice to know Supreme Leader Snoke's backstory? Absolutely! (wait a second...) The fact remains that I'm not in control of which characters they release, so I'll be happy with what I get. It didn't even make 10000 votes until July 2018, and the decision panel was obviously much later than that. 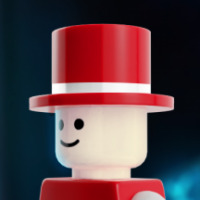 So if these are only in the CMF because of the Ideas set, it suggests something else got bumped off the CMF - they often state that the CMF are designed and planned a year / long before their release. They could always use a Bombur style hairpiece that extends lower down. Hahahaha @CCC that would be hilarious (and wrong, so, so wrong!). ^ Three! Frozone, Nick Fury, Mace Windu. I'm not holding my breath for a Mr. Glass or Jules Winnfield minifigure. Jack and Sally are still pretty popular figures. It's not a coincidence that they show up prominently in video games, toys, at the Disney Parks, etc. They were amongst the Brickheadz, so it doesn't surprise me that they were in this CMF mix. Hercules, on the other hand - he's shuffled in with those not-quite-super-successful Disney movies. I'd posit that Hades is disproportionately more prelavent in the Disney villains pantheon that what the success of the movie would warrant. 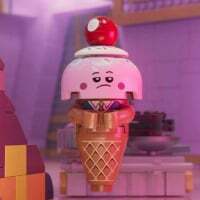 If they thought that the "triplets" were a good idea for this series, I wouldn't put it past Lego putting the Seven Dwarfs in future series. I was never a big fan of Disney movies/characters growing up. I'm more a Merrie Melodies/Looney Tunes kinda guy. I think that is why I'm not all bent out of shape about Hercules/Hades being in this series. If their inclusion opens the door for more mythological characters from the movie like Zeus; I'm all for it. If they thought that the "triplets" were a good idea for this series, I wouldn't put it past Lego putting the Seven Dwarfs in future series. Or they'd do six and really piss people off. Or how about 1 dwarf per series? Then make him a chase figure, one per case. I would only agree with this if that would guarantee seven more CMF series coming down the pike. How about 3 pairs of exclusive dwarves, for B&N, Target, and Walmart, one dwarf available only directly through The Lego House in Billund, and make Snow White a Comic Con Honolulu exclusive. I like this idea more than seven chase figures. This only gets a 60% boo. BOOOO!! So there you have it, even though Steamboat Willie was revealed first the CMFs were actually developed first. I guess that’s the reason they put silver on the steamboat willie figures, to make them ‘more special’? It is the 90th Anniversary of Steamboat Willie - so nobody should be surprised by this. There is a fair amount of merchandise and promotions going on for this rather arbitrary anniversary. I’m late to the party, but I do love the Steamboat Willie set. Growing up as a big Disney fan, I’ve always wanted a Lego set depicting Mickey Mouse’s first appearance and now finally we have one! I think everything about the set is great except for the price. As with many other people in this thread, I’m going to wait for a sale; most likely when Amazon starts selling it for 20% off. 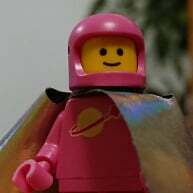 As for the new CMF series, I think it looks great, but it lacks the “wow” factor the first series had if that makes sense. With the first series, well over half of the figures were must-haves for me and while I’m definitely looking forward fo picking up the complete set for Disney Series 2, none of the figures are as mindblowing as the ones from the first. Tangent aside, my favorites are the Vintage Mickey and Minnie (even though they are identical to the ones from the set), the Ducktales quartet, and Jasmine. I’m pleasantly surprised by the inclusion of Edna Mode (one that doesn’t give me nightmares...) and Frozone and am also surprised that these are the only Pixar figures included. Hopefully Goofy and Pluto will be included in a future D2C set or CMF series, because their omission is rather puzzling. Overall, I’m pretty pleased with the recently-revealed Lego Disney products. Except for some silver printing, they’re close enough to me. Fine. I like the Vintage Mickey and Minnie CMFs despite the fact that they are very similar to the ones included in the set with a few minor changes. There, everybody happy? Seems strange to me that they did the vintage figures 4 in a box, but good for Anna and Elsa, can imagine those will be very popular with kids! Annyoing to have 2 only of the cousins, but better that than one chase figure I guess. But technically they is not. I find the Chip and Dale tails a bit disappointing - shame they couldn't have used a moulded tail.